You can buy a 16 fl. oz. 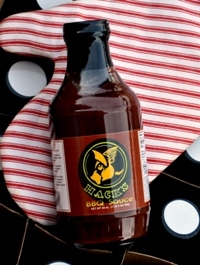 bottle of Hack's BBQ Sauce for just $4.95. 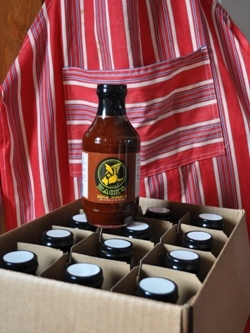 You will love the taste of our sweet and tangy barbecue sauce. It's thick for basting so you don't waste a drop! Free Shipping for one bottle!! Take advantage of our Free Shipping offer for one bottles! (US only) Pay only $1.95 for 2 to 4 bottles. For orders from 5 to 12 bottles, pay only $9.95 for shipping & handling! When you click on the Buy Now button, you will be taken to a secure PayPal page titled SCDware Corporation, our parent company. You can use your PayPal account, credit card or debit card to pay for your purchase. Hack's comes in glass bottles to preserve its great taste. And glass bottles are 40% lighter than they were 20 years ago, so we can keep the shipping costs low. Bottles may be shipped via USPS Priority Mail, Priority Flat Rate boxes or Parcel Post, and UPS Ground or FedEx Home Delivery.